Let’s take a quick look at some of the differences between LTE and 5G (maybe I’ll make a series out of this, who knows :)) and today it is in the area of functional splits between RAN and Core Network. The figures below show high level splits of selected functionalities of the main “network functions/nodes” in both systems (discussing it from the 3GPP RAN3 WG perspective) from which we can make some conclusions on the differences between those two systems. For the sake of clarity and from puristic reasons let’s use the names EPS (Evolved Packed System) and 5GS (5G System). (However, for the simplicity reasons, we’ll use the LTE term interchangeably with EPS :)). The first figure captures basic functional split between E-UTRAN and EPC (within EPS) where the main nodes include eNB, MME, SGW and PGW (based on figure from ). 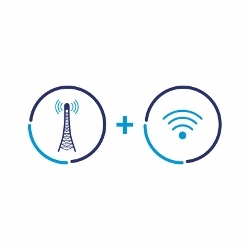 eNB is responsible for management of the radio resources, radio connectivity and connected mode mobility. MME is the main signalling node in EPC covering NAS level signalling, idle state mobility and session management. On the other end SGW and PGW mostly deal with UP packet processing, but also cover other aspects like UE IP address allocation, packet filtering and accouting data generation – which more fits into Control Plane. Here we also have S1 interface that has two versions: S1-U and S1-C to capture the UP and CP split on the borderline between RAN and CN. If you want to have a full list of functions between those network elements in LTE refer to  chapter 4.1. The second figure (based on figure from ) presents a similiar approach to show the functionality placement onto different network functions/elements within 5G system (5GS). Here the RAN (called NG-RAN) consists of gNBs (NR base stations) and/or ng-eNBs (LTE base stations supporting 5G Core Network). As we can see from the figure, most of the functionality is similiar to what we have in eNB from E-UTRAN, with some differences not shown in the figure, like support for Network Slicing or QoS related aspects (QoS flow management and mapping to radio bearers) and tight interworking between NR and E-UTRA. Now, in the core network (called here 5GC) we have some more basic differences vs what we have in EPC. 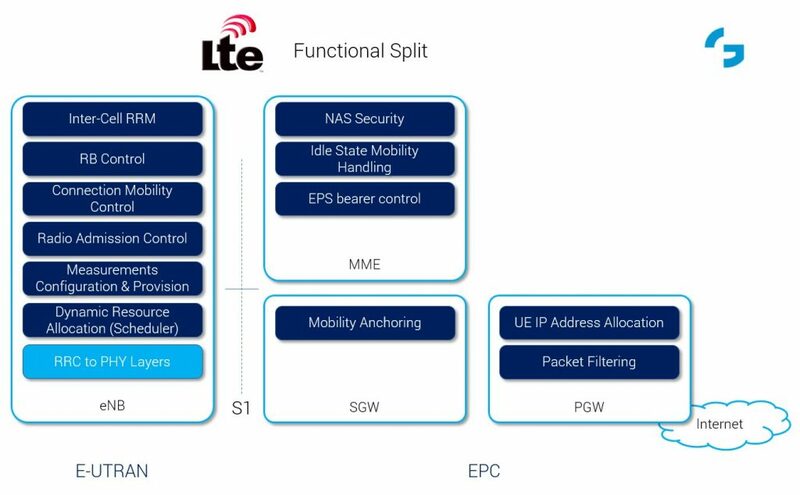 First, in 5G we have a full CP/UP separation, where the upper functions provide solely CP, where, compared to LTE, 3GPP took out the session management from MME and UE IP Address – aspects from PGW and put to Session Management Function (SMF). What is left from MME, namely mobility management and network access, registration, security etc., is put in a separate node, called Access and Mobility Management Function (AMF). On the data plane side, we have a network function performing purely packet processing and transmission operations, called simply User Plane Function (UPF). In terms of the interface between NG-RAN and 5GC, similiar to EPS world, we have an interface called NG, also using two versions: NG-C and NG-U connected to AMF and UPF respectively. (However, if you speak to 3GPP SA2 representatives, you may hear that those are termed: N2 and N3 reference points). If you want to have a full list of functions between those network elements refer to  chapter 4.2. 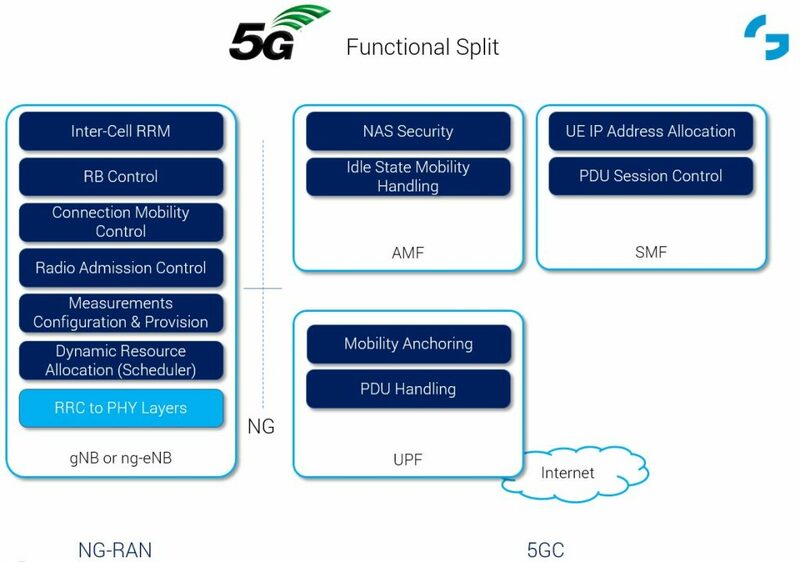 Also, note that there are many more of CP functions in the full 5GC architecture – see our posts discussing this here: 5G Core Network Functions and 5G Core Network Overview. … and more that I’ll try to write about in the next posts (if I decide to make a series out of this :)). 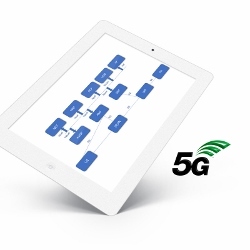 Hope this post helps you to get some answers, if you have questions like: “what 5G actually is” and “how is 5G different from 4G” or similiar. If you are interested in some other comparisons (or rather comparisons of other aspects, like architecture, PHY layer, air interface, …) between those two systems, please comment below and I’ll try my best to adress those in the future. Could you elaborate more on the CP/UP split in 5G. In 4G, the NAS is sole carried out by the MME and the S/P-GW is responsible for the U-plane. I think in LTE, the CP and UP are already splitted. I am not clear about the CP-UP split differences in 5G NR comparing to 4G. thanks for your comment. Yes, you are right, in LTE, signalling between UE and network is carried by MME using NAS, and S/P-GW is responsible for U-Plane. However, some of the session related signalling is carried by S/P-GW, thus the S5 interface, between S-GW and P-GW has both C- and U-Plane part, e.g., UE IP address allocation that has to be transferred from P-GW to S-GW that then passes it to MME (also session setup from PGW to MME is transferred through SGW). However, in latest releases of LTE-A Pro there is a feature standardized (i.e. CUPS) to make this split more complete. In 5GS, we clearly have this separation where SMF takes some of the “PGW’s CP-like” functions and leaves the packet-only processing aspects to UPF. Hi Marcin, thanks a lot sharing difference. 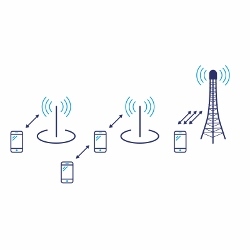 can you please share the info of synchronization of LTE & 5G? i.e. how the PSS and SSS are dfferent in 5G and how UE latches on 5G nodeB? also if possible 5G throughput calculation for Sub 6 radio i.e. 3.5 Mhz with 100 Mhz BW? Thanks Sumit for your question. This could be another post on the details between LTE and 5G NR as it’s not a short answer. So, please stay connected, and I’ll put that onto my agenda for future posts. Nice explanation !! Marcin ,Is there any reference documents available to study in detail . I’ve put the sources (3GPP Specs numbers) in the “References” below the post – and those would be the good starting points for further read. Please let me know, if you need anything else. Why we have mobility anchoring in UPF , which mobility it refers to & why not it is in AMF ? We already have idle mode mobility in AMF & I guess in LTE even connected mode mobility related signalling was also in MME ? thanks for your question. The UPF is responsible for PDU session anchoring – i.e. when the UE moves around and changes cells/gNBs the IP session is kept (and UPF switches the path between gNBs when needed), so it strictly relates to UP packet forwarding – similar to what was done in LTE by SGW. However, traffic forwarding rules and policies are provided by SMF.